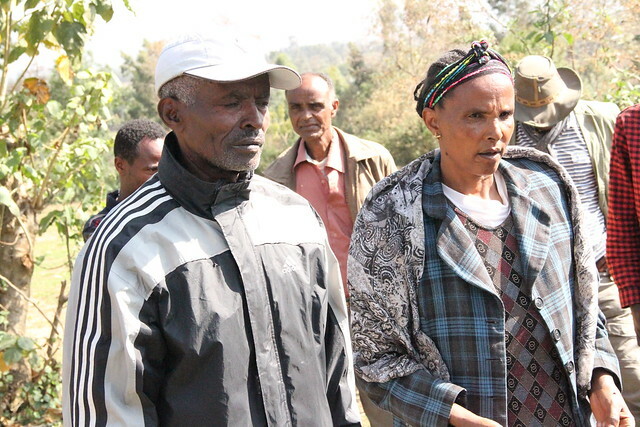 Bekelech Belachew and her husband in Hossana in April 2017 (photo credit: ILRI\Simret Yasabu). Bekelech Belachew, 53, lives with her husband and five children in Jawe Kebele, Lemo District in the Southern Nations, Nationalities, and Peoples’ Region of Ethiopia. Jawe is one of the kebeles where the Africa RISING project has been operating since 2012. Bekelech and her husband (a retired teacher) have farmed food crops and kept livestock on their half-acre plot of family land for many years. But productivity has been very low due to the limited land, poor rainfall, limited access to water, inability to diversify crops, shortage of animal feed, and limited income, among other factors. Six years ago, when the Africa RISING project started its action research in Jawe, Bekelech joined the project and started involving in the research protocols from the project to improve livestock fodder production. She also started cultivating avocados (a high value tree) and begun water development and small-scale irrigation. Within two years, she had become an active participant in the various social learning platforms organized by Africa RISING such as research group meetings and field days. 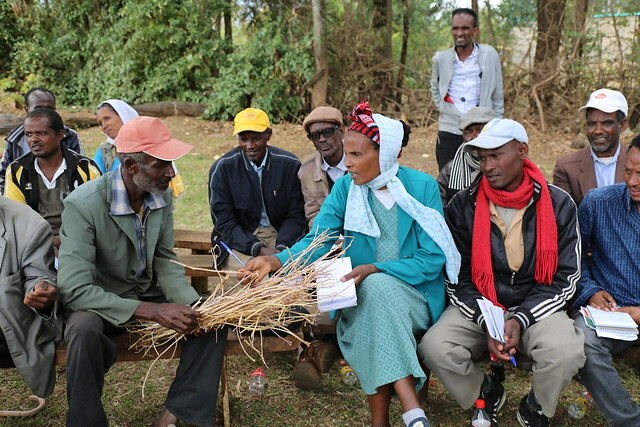 She joined farmer exchange visits to Tigray and Amhara regions in 2014. The visits combined learning from the watershed management interventions in both regions which are led by the International Center for Tropical Agriculture (CIAT), and lessons on improved avocado production from Butajira, led by the World Agroforestry Centre (ICRAF). After the visits, Bekelech constructed water percolation ditches on the upper side of her farm and a dug shallow well on the lower side. 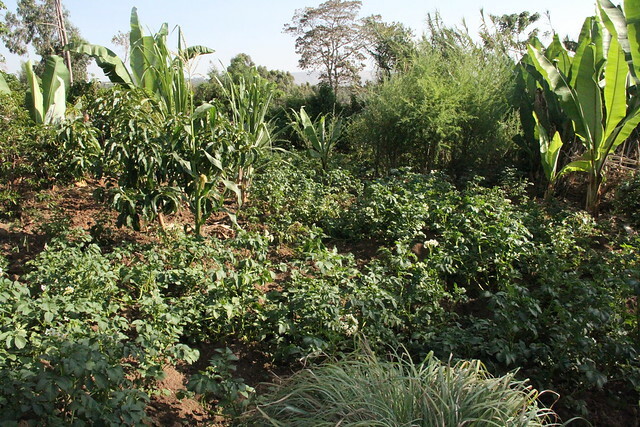 She started using the water from the shallow well to grow vegetables such as cabbages, beetroot and carrots. In recognition of her efforts, Africa RISING and CIAT gave her a geo-membrane (lining sheet for water harvesting ponds) which she used in a rainwater harvesting pond to collect more water to expand irrigation activities. Africa RISING and ICRAF also gave her six grafted avocado seedlings sourced from the horticultural centre in Butajira. The following year, she bought 10 additional seedlings from the centre to expand her avocado farm. She also put an effort to improve the feed gaps her cattle were experiencing. In this regard, she planted tree lucern (a multipurpose fodder tree that the project introduced), and started mixing it with crop residues for livestock feed. Bekelech says she has experienced a chance of fortunes in farming resulting from her engagement with the project. ‘I have achieved a lot,’ she says. ‘The skill and knowledge I have gained enabled me to improve how I farm and to try out new crops which has increased my farm output.’ Using irrigation for farming has also increased income for her family. She says she has earned more than ETB 5,000 (USD 180) by selling vegetables. Sources of family income are also now more diversified; and due to dietary diversification her family is now healthier and nutritionally secured. Her animals are fed cultivated fodder which has increased their productivity. Bekelech Belachew uses the water from the shallow well to grow cabbages, beetroot and carrots (photo credit: ILRI\Simret Yasabu). Her best practices in farming have been recognized by the regional government and she received a prize at the model farmer’s festival in 2017. 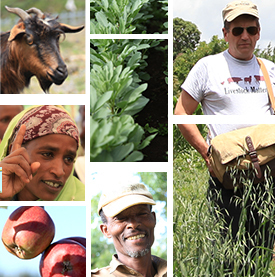 Bekelech’s farm is now a learning centre for others seeking to know how to intensify farming in similar small land holdings in the region. 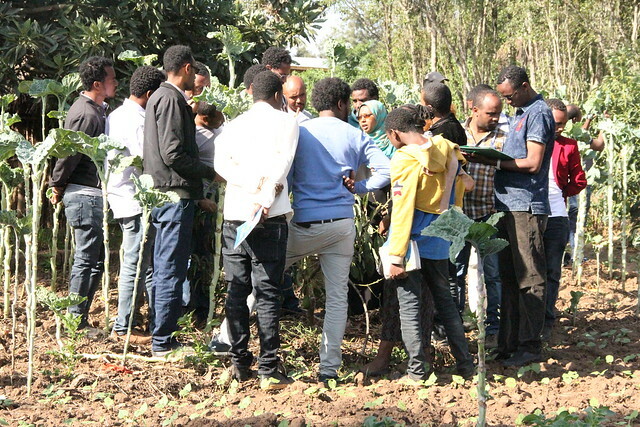 The Natural Resource Department of Wachemo University is now using her farm as a site for practical farming lessons and she travels to other parts of the region and country to share her farming experiences. Tags: International Women's Day. Bookmark the permalink. This is a very nice piece. It encourages project actors to push forward until we ensure the emergence of many more ‘Bekelech’s in Ethiopia and elsewhere required.